I love this year’s gift because it’s so thoughtful. Remember the psychic I went to see last week? She told me that I should take sea salt baths every now and then to remove any negative energy that’s attached itself to me. I know it sounds very hokey pokey and believe me – my husband is SO NOT INTO THAT SORT OF THING. But, I am and I was determined to get some sea salt. I ended up picking some up at the supermarket and have been trying that out the last few days. Well, Bill went and bought me an entire collection from Ahava that uses DeadSea Salt (bath salt, hand cream, body lotion, foot cream etc). It just shows me that he listens to me / cares about what I need – even if it’s not something he necessarily believes in. 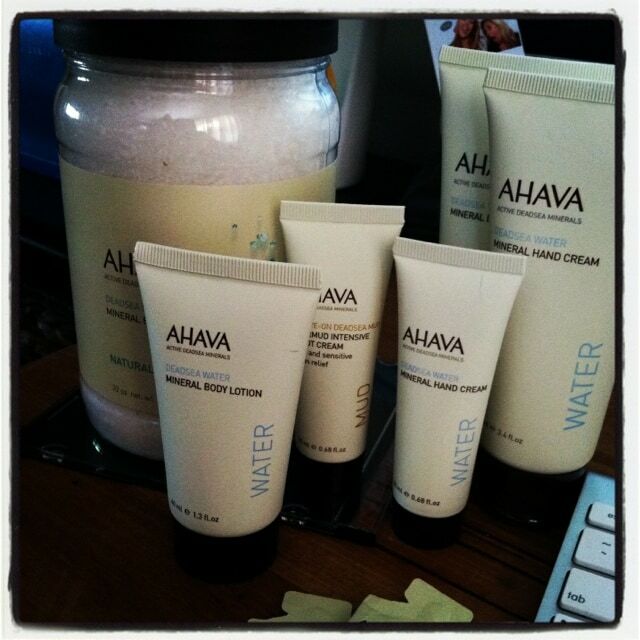 Vera/Bill…I live in Nassau County and am obsessed with Ahava. I know I can order it online but I would love to know what store carries it. Can you ask Bill where he got it? Thanks! Awww how special & thought of Bill. Merry Christmas!